Sunday September 14: Sitting on a log in the sun rather than at a campfire this morning, I enjoy the beautiful blue sky, sunlight on tree branches, and the promise of a warm day. Read from the Course in Miracles “I see nothing as it is now” – but what am I seeing if I don’t see it as it is now? 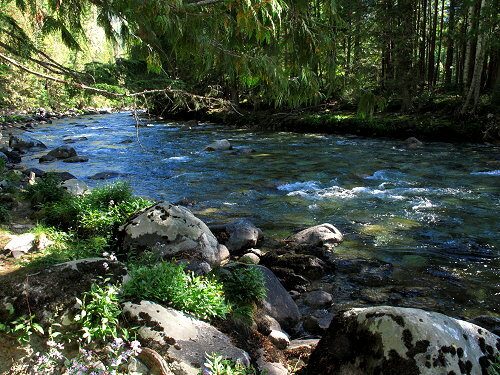 Unless it means I don’t see the Whole Truth of the river, the blue sky, the tree, and so on. That concept I can understand – who can know the Whole Truth of anything? But the way it is explained does not resonate with me. We take showers (thank goodness for sunshine) and then head to New Denver. Today I have a red latte – very tasty – with my sandwich. I upload a blog to wordpress and send some emails while Clifford does what he needs to do. 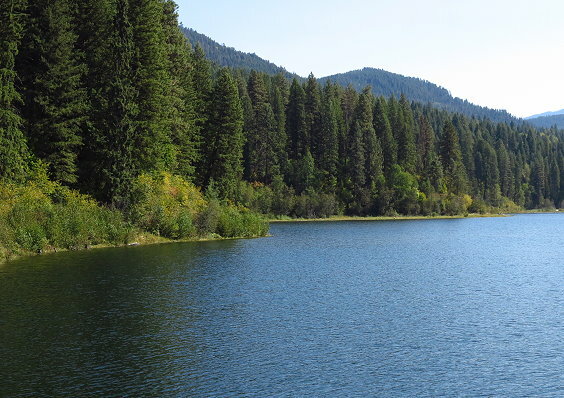 After taking care of our internet business, we head down to the park alongside the lake. It sure is pretty here. 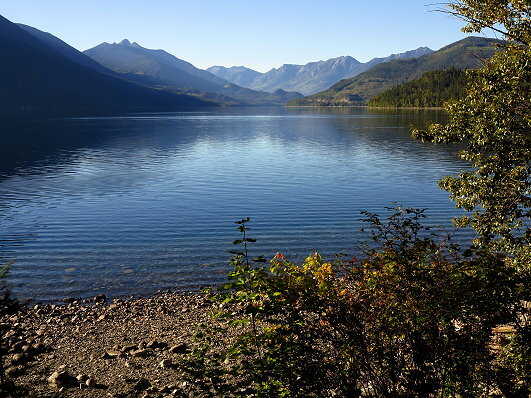 I am really going to miss Rosebery, Slocan Lake, and New Denver. Back at camp, I make my last campfire and we begin packing up the things that we won’t need in the morning. 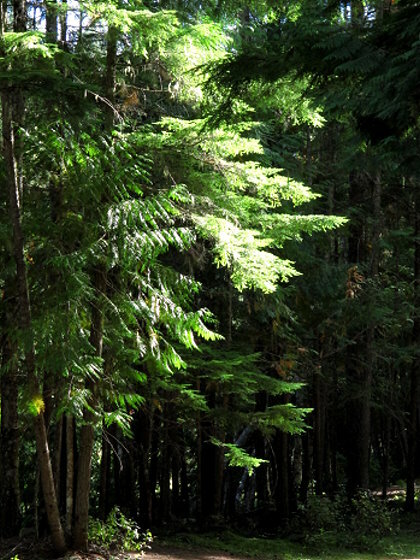 Monday September 15: I get up as the sunshine comes through the trees. No time for a campfire this morning. Finish packing, make tea for the road, and within a couple of hours, our Pony home becomes a little rectangle to be pulled down the road behind the Blazer. Before we pull out of our spot, I go down to Wilson Creek to say good-bye. 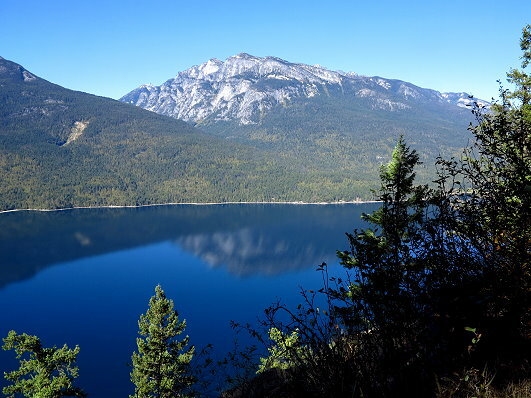 As we travel south on highway 6, we pull into a scenic overlook so I can say good-bye to Slocan Lake. Good-bye, good-bye. But I’ll be back! Then on to Nelson. 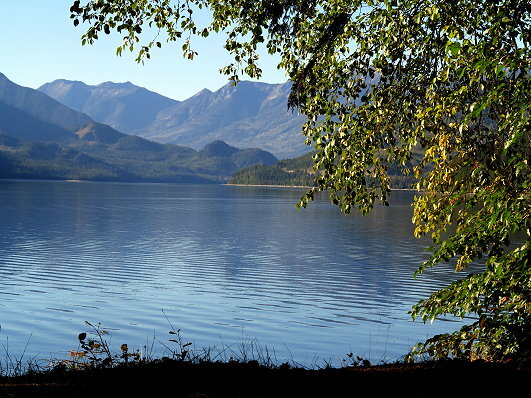 We had heard about Nelson, a town we should visit while in British Columbia. 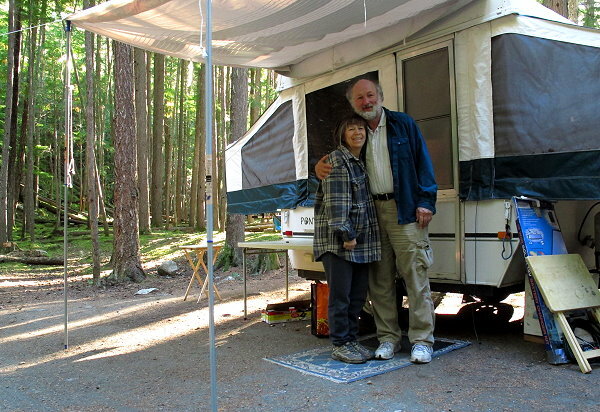 Once we get there, we discover it is very difficult to find parking when traveling with an RV. Eventually we find a spot at the far end of town and walk uphill to the main downtown, which, like other tourist towns, is filled with galleries, gift shops, and cafes. If a person has money to spend, then Nelson would be lots of fun. But I have neither the money nor the need to buy stuff. After a little lunch, we walk the streets looking at all the attractive wares, but I am glad when we head back to the Blazer and hit the road. 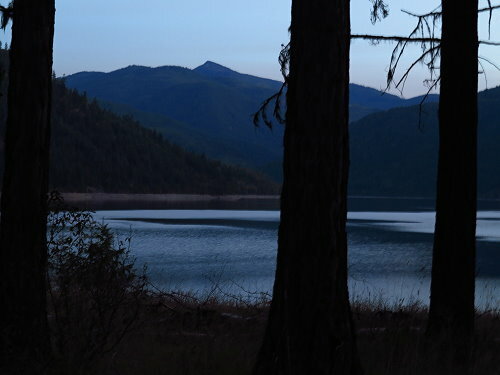 We are going home by way of Coville National Forest in eastern Washington and our destination is a small reservoir called Sullivan Lake. Several campgrounds are shown on the map, but the first two we come to are closed. Luckily, we spot a small 10-site campground not too much further along and since there is only an hour of daylight left, we quickly find a spot and begin setting up, keeping it as simple as possible since we won’t be here long. It may not be Rosebery, BC, but it is a pretty spot surrounded by big old trees and a little lake nearby. Some health issues have reared up again today: heart palpitations and the sound of my heart beating in my eardrum and a headache (very unusually for me). Obviously something is not as it should be. Going to have to look into this once we get back home. But in the meantime, I am glad when the Pony is set up and we have a moment to walk down to the lake as dusk becomes night. A peaceful close to our journey today.